Three U.S. eventers, Jennie Brannigan, Hannah Sue Burnett and Alyssa Phillips, are currently suspended from the Fédération Equestre Internationale after the organization reported all three tested positive for prohibited substance amfetamine at the Ocala Jockey Club International, held Nov. 16-19 in Reddick, Fla. In addition, Brannigan tested positive for methylphenidate and ritalinic acid, and Phillips also tested positive for canrenone. Hannah Sue Burnett, winner of the Jockey Club International CIC*** with Harbour Pilot, has tested positive for a prohibited substance and is currently suspended by the FEI. Photo by Lindsay Berreth. Amfetamine and ritalinic acid (a derivative of phenethylamine) are listed by the World Anti-Doping Agency as prohibited substances for competition in the stimulant category. Canrenone is a WADA-prohibited substance in the diuretics and masking agents category. Under WADA rules, riders can apply for a therapeutic use exemption if prescribed a prohibited substance. “In accordance with the WADA Code, the FEI has notified WADA and the U.S. Anti-Doping Agency of the positives,” stated the FEI in a release. All three eventers have a suspension start date of Dec. 21, and the end date is pending an FEI Tribunal decision on the case. The riders can request a lifting of the provisional suspension and ask for testing of the B sample within the next 21 days. The FEI Tribunal will also determine what happens to the riders’ placings and prize money from the event. 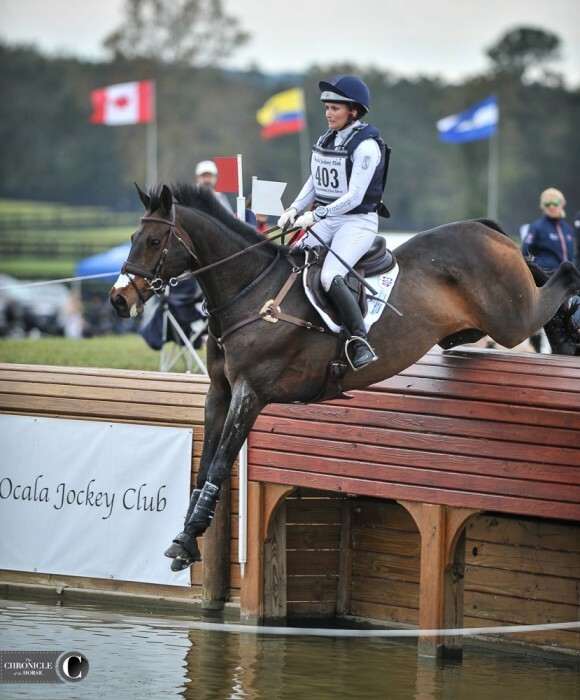 Burnett, 31, won the Ocala CIC*** with Harbour Pilot, earning prize money of $14,800, and she also placed 47th in the CCI* on Strattonstown Lewis and retired on cross-country in the CIC*** with Cooley Dream. Brannigan, 30, competed Cambalda in the CIC*** division at Ocala, placing 21st. Phillips, 21, earned seventh in the CCI* with Cooley Caviar, sixth in the CCI** with Oskar and was eliminated on cross-country with Bliss III in the CIC***. Burnett could not be reached for comment, and Phillips did not wish to make a comment.